Why a Special Collections blog? Why a blog about “memory”? The title (and focus) of this introductory post is adapted from the title of a book by Simon Sinek, Start with why (2009). In it he suggests that why we do things is more important to our success and fulfilment than what we do or how we do it. I don’t know if that is true in all areas of life, but it rings true for me in my work as an archivist. So let me start with why I do what I do. And that may answer the questions about this blog posed above. Let’s face it — much of the work of an archivist, like that of a lexicographer, is drudgery. I’m not sure I would call it harmless drudgery, à la Samuel Johnson. For a start, there is a lot of heavy lifting involved. And dust. And mould. And paper cuts. And any archivist who has arranged and described a large organisational archive will testify to how deathly boring those records can be. One of my favourite articles about the work of an archivist has the title “Archival theory: much ado about shelving”. Alas, to a large extent that is true; much of the work of a traditional archivist involves moving large volumes of paper from one form of container into another and ultimately onto a shelf. Here I must resort to a sort of meta-narrative — using a story about an archive to tell the story of why I am an archivist. The story I have in mind is a television drama, Shooting the past, a 1999 masterpiece (IMO) by Stephen Poliakoff. 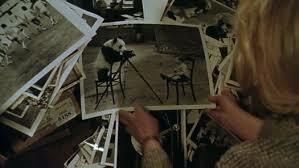 It is the story of a photograph archive that is threatened by an American property developer. The developer has bought the building that houses the collection, and wants to remodel it for commercial purposes. The collection must thus be moved. The staff is determined to prevent the collection being dispersed, broken up, or destroyed. Using the extraordinary power of photographs to tell stories of the past, they work to change the mind of the rapacious developer. Aside from being a meditation on the magic of photographs, Shooting the past is a commentary on the split between two worlds – the cut-throat world of “progress” and “development”, and the gentler world of those who seek to preserve the past. What struck me most, however, was the personal toll exacted on staff members by the imminent threat of their collection being gutted – and I use that word deliberately because the staff felt real pain, visceral pain, at the prospect. One of them even tries to commit suicide … but I won’t elaborate further. If you have not seen the production, I’d recommend that you do. The point I am making with all this is that Shooting the past illustrates very vividly why I do what I do – it is because of the collections. Whether they are boring organisational archives, or fading, sepia-toned or silvering historical photographs, or the dusty, insect eaten papers of a notable person rescued from some attic, it is the collections that matter. They are the bread-crumb trails to truth, the remnants of a distant reality, pieces of the jigsaw puzzle that is the past, fragments of memory that, when reassembled, tell stories that are worth telling. It is all about the collections. And that is why this blog now exists. It is one more avenue for the collections to become more widely known and used. The primary focus of the blog will be on what we do in Special Collections to preserve memory. Not simply UCT’s institutional memory, though we do that; society’s memory – the memory of people and places and events that mattered, and still matter. Memory, as we well know in South Africa, is and will always be a contested space. Memory, particular constellated memory such as that found in institutions such as archival repositories, can be skewed; it can be erased; the memory of a group can be under- or over-represented, mirroring the power structures within a society. This blog will grapple with these issues as we go about the work of preserving memory at UCT. But it will also encompass issues that affect memory and memory institutions (heritage institutions) more generally – issues such as the challenges posed by the ubiquity of digital technology and our inability to preserve but a sliver of this vast record; issues such as states that want to operate in secret and a populace that is becoming more insistent upon openness. And fear not. I won’t be writing all these posts myself. My learned and competent colleagues in Special Collections will be sharing that responsibility. So, welcome to Memory@UCT. I hope through this blog you will come to appreciate the “why” of archives and special collections.